Gone are the days when people solely depend on the mainstream jobs. Thanks to the technology. The income opportunities have eventually grown with evolution of Internet. The major search engines had risen to that significant places where they are ruling the whole web. So, Google was the first search engine which came up with an earning opportunity for webmasters. On the other side there were thousands of Entrepreneurs and companies who created freelancing jobs for freelancers worldwide. The beauty of Internet is that everyone is connected. There are many legitimate resources for people who really want to make money online. Sky is the only limit. There are ample opportunities for all netizens. Blogging : The term blogging may sound strange and some might think it as a complicated career. Many of you might heard of it but you may not find the right information. There are thousands of articles about blogging. I would like to make it simple. A Blog is nothing but an online diary. In olden days people loved to write diaries. You can write anything you desire. Some might be interested in poetry and some might be interested in philosophy. So it all depends on your own likes and dislikes. But the basic difference is you are sharing blog posts with the whole world where as your diary is personal. So, coming to the point blogging is your own perspective. You can write about current affairs, gossips, poetry, technology, celebrities, movies, sports or anything. But, remember that your writing doesn’t hurt any person or institution/company. As long as it is sensible and valid you don’t need to worry about it. Making the content appealing and humorous will attract more readers. The more readers you get the more income you can earn. The interesting fact is 90% of the bloggers are making money out of their blogs. Consistency also plays a vital role in attracting more readers. These days video blogging is equally popular as mainstream blogging. Once you have adequate followers and readers you can signup for Google Adsense. Make sure that you haven’t violated any of their rules. If everything is perfect they will approve your account. Many bloggers dream of having Adsense account because of high rates. 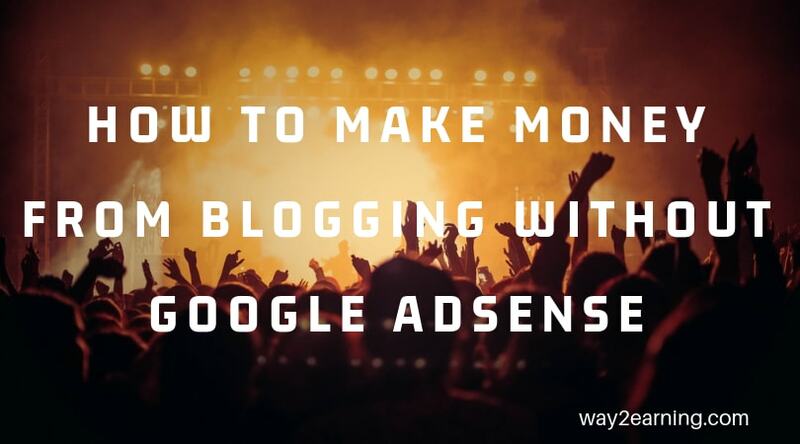 Many prominent bloggers are making six figure monthly income with Adsense. Don’t do blogging just for making money. All you need is passion and making content informative. If people find your content appealing and helpful then automatically your income would boost in few months. The bloggers must not expect to make huge money in the first month itself. It really takes some time for things to happen. The bloggers must rather concentrate more on content. If you don’t get approval from Adsense for any reason you can go with other ad networks like Media.net and AdCash. You might be a good writer or a logo designer and you want to earn with your skills. There are many freelancing sites where you can sell your services. I have seen many successful freelancers charging over $1000 per hour. The best service you give the more credibility you get from clients. There are stupendous websites like upwork.com and freelancer.com where you can get a lot of work. Selling gigs is the easiest way to make profits in no time. You don’t need to invest anything. You can register on sites like Fiverr to offer your basic services for $5. There are many freelancers offering $5-$20 for additional services. The skilled freelancers can try selling gigs as it is a profitable model. Many Internet marketers, bloggers and webmasters use link shortening networks to shrink URLs. You don’t need to have a technical knowledge to shorten URLs. It is a simple way to make money online. There are hundreds of link shortening networks. Among them you can give a try to Shorte.st network. You get paid when someone clicks on your link and views the ad. Affiliate marketing is ruling the Internet since its inception. You get paid when someone buys a product/service from your affiliate link. Many freelancers, webmasters and bloggers are making tons of $$$ per month. To be a successful affiliate marketer you must have a huge list of subscribers or followers. To gain following you need to impress people with your blog/product/service. So affiliate marketing is not so easy as contextual advertising. Establish yourself before getting into affiliate marketing. Write down the areas where you are really strong. For instance you are good at cooking. Try to promote recipe books or products related to cooking. You need to try the product before promoting it blindly. Most of the marketers fail because of this very reason. You’ll know the pros and cons of product/service after giving it a try. So it would be easy for you to market it to the right people. You could try CPA networks like Peerfly or Adcombo for best rates. Even Apple iTunes is offering a great affiliate program. Website flipping is still a profitable business for many webmasters and freelancers. Flipping is nothing but buying established sites, adding value content to them and selling again for more profits. But there are some things you need to look while buying websites. Make sure that the site is good enough in terms of authority, traffic and revenue. Apart from buying established sites you could also go for domains and apps. You could try sites like Flippa and Empire Flippers for best websites and domains. These sites take commission for every successful sale. Remember the above sites take commission from the sale and in return you get royalty. You can read this article to know tips to get your photos noticed. Hope this 7 Legitimate Ways To Make Money Online article help people to follow their dreams. If you have anything to say then do write your comment below. If you found this article informative then please do share with your friends. Often visit your blog ! and learn nice concepts on making money. Just before visiting this post, i have read about the crowding funding concepts which i don’t know.. will definitely research how it really works and also i heard one tamil film was made completely with crowding funding. About this post! The internet providing multiple ways to make money online and my fav. is blogging and we can earn several methods with a single blog. But must aware how blog works and what kind of traffic is important to monetize through a blog. Thanks for sharing your knowledge and keep posting valuable information.